The mobile chip and patent giant just issued downbeat guidance that's partly the result of its falling out with Apple. Can 2019 and 2020 5G phone ramps come to the rescue? During Qualcomm's (QCOM - Get Report) July 25 earnings call, the term "5G" was said 39 times. During the Nov. 7 earnings call, it was said 40 times. A look at the mobile chip and patent giant's December quarter sales and earnings guidance drives home why it's eager to talk so much about 5G phone and network rollouts that are expected to start in earnest next year. After the bell on Wednesday, Qualcomm reported September quarter (fiscal fourth quarter) revenue of $5.83 billion (down 2% annually) and non-GAAP EPS of $0.90, topping consensus analyst estimates, respectively, of $5.53 billion and $0.83. Stronger-than-expected MSM (processor and modem) chip shipments to Chinese smartphone makers helped, as did a lower-than-expected 1% tax rate and -- thanks to a recently-launched $30 billion buyback program -- a whopping $21.1 billion worth of stock buybacks. However, Qualcomm also guided for December quarter revenue of $4.5 billion to $5.3 billion, down 13% to 26% annually and below a $5.59 billion consensus. MSM shipments, which were up 5% annually last quarter, are expected to be down 18% to 26% to 175 million to 195 million. And licensing division (QTL) revenue, which fell 6% last quarter, is expected to be down 15% to 23% to a range of $1 billion to $1.1 billion. Non-GAAP EPS guidance of $1.05 to $1.15 was officially above a $0.94 consensus. However, this outlook benefits from an expected $525 million to $575 million one-time tax benefit that management believes will provide about a $0.45 boost to EPS. On Thursday, Qualcomm shares fell 8.2% to $58.05. They're now down about 9% on the year. Qualcomm sold off earlier this year as Broadcom's (AVGO - Get Report) hostile bid for the company was shot down by the Trump Administration, rallied in the spring and summer with the help of major buybacks and then fell again in recent weeks amid a tech correction. Apple's (AAPL - Get Report) decision to solely use Intel (INTC - Get Report) modems (along with complementary Intel parts such as power management and RF transceiver chips) within the iPhone XS and XR, after having used both Intel and Qualcomm modems within its 2016 and 2017 iPhones, is clearly weighing on Qualcomm's MSM shipments. And though Chinese share gains and growing automotive, networking and IoT chip sales have softened the blow a bit, weak global smartphone demand is also weighing on Qualcomm's chip business. Research firm IDC estimates smartphone shipments fell 6% annually in Q3 to 355.2 million. Soft smartphone demand is also weighing on QTL revenue, which stems in large part from royalties owed by OEMs on a prior quarter's phone shipments. And -- as was already the case in 2017 -- so are Qualcomm's ongoing licensing disputes with Apple and an "other licensee" that's widely believed to be Chinese equipment maker Huawei. While some progress appears to have been made in the Huawei dispute -- Qualcomm says it signed a $700 million interim agreement with its "other licensee" in fiscal 2018 -- the Apple dispute seems to be far from resolved. On Wednesday morning, Reuters reported hearing from a source that "absolutely no meaningful discussion" is taking place between Apple and Qualcomm. The report comes more than a year after Apple ordered its contract manufacturers to stop paying Qualcomm royalties owed on iPhones and other 3G/4G-capable hardware. Recent legal rulings may have bolstered Apple's resolve to keep fighting. In September, an ITC administrative law judge ruled that Apple is infringing a non-standards-essential Qualcomm patent, but refused to call for an import ban on the iPhones deemed to be infringing it. The case will now go to the ITC commission. Separately, earlier this week, a federal court handling an FTC lawsuit against Qualcomm ruled that the company has to license its standards-essential patents (SEPs) to rival chipmakers such as Intel and MediaTek. If upheld, this ruling, which will likely be appealed, could result in Qualcomm only collecting royalties on SEPs based on a modem's selling price, rather than (as is the case today) the selling price for the device containing the modem. 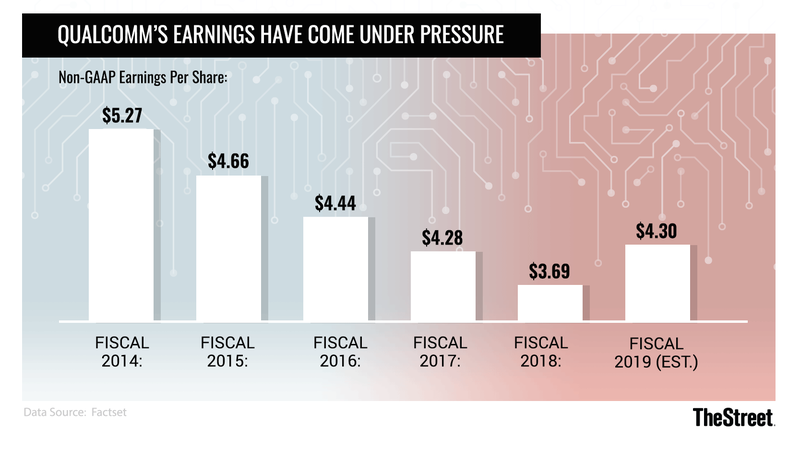 Collectively, these top and bottom-line pressures make it all the more important for Qualcomm that 5G phone sales ramp in a big way in 2019 and 2020. In addition to potentially boosting smartphone sales, a rapid 5G ramp could help Qualcomm take modem share. Qualcomm's Snapdragon X50 5G modem has already seen numerous design wins among major Android OEMs (but not Apple, which reportedly plans to wait until 2020 to launch 5G iPhones containing Intel modems). Strong 5G uptake could also boost smartphone average selling prices (ASPs), and with them the average per-device royalty that Qualcomm collects. They could also act as a boon for Qualcomm's RF chip business; the company has launched 5G RF antenna modules for both millimeter-wave and traditional sub-6GHz frequency bands, and has argued that its ability to supply both a phone's 5G modem and its RF circuitry will be a major competitive advantage. However, it will take a little while for major carriers in the U.S. and elsewhere to build out their 5G networks to the point where the lion's share of their customers are covered. And at a time when 4G networks already deliver average download speeds north of 20Mbps to many consumers, phone buyers will need to be convinced that upgrading to a 5G device will yield major user experience improvements. Qualcomm's stock is certainly cheap: Even with analyst estimates discounted due to the company's licensing disputes, shares trade for only 13.5 times a fiscal 2019 (ends in Sep. 2019) EPS consensus of $4.30, and 11.6 times a fiscal 2020 EPS consensus of $5.01. And the company has done a pretty good job in recent years of both investing in 5G R&D and growing its chip unit's exposure to growing areas such as RF, automotive and IoT. However, with its licensing issues still an overhang and any major 5G phone ramp at least a few quarters away, there's a lot of uncertainty for now about Qualcomm's growth outlook for at least the near-term.